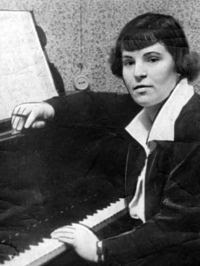 Today's Composer of the Day is Galina Ustvolskaya. Ustvolskaya was a Russian/Soviet composer with a distinctly individual, experimental style. During the Soviet years, her music was suppressed as decadent (and, notably, quasi-religious), but she managed to make a living writing pro-Soviet screed pieces. Her main composition teacher was Dmitri Shostakovich. He admired her greatly, and (after the death of his first wife) unsuccessfully asked her to marry him. She declined. After a time, she broke free of her mentor's influence and developed a unique style of composition including tone clusters, pounding rhythms, and unique instrumental combinations. For example, her piece Composition No. 2 is scored for 8 double basses, piano, and percussion (a wooden box!). Interestingly, all of the pieces in her representative (that is, not Soviet-official) style include piano, percussion, or both. Her insistence on large, repeated blocks of sound earned her the moniker "The Lady with the Hammer." Which is an awesome nickname. Her music is unique and beautiful. You can hear the part of the aforementioned Composition No. 2 here. I have no idea what the video is about. It sure is strange though. She was opinionated. Some great quotes are here. Although she remains relatively obscure, there exist recordings for you to purchase. Or download, whatever. You should listen to her music. That is the best nickname ever. It really does fit. You should listen to her music. Are you quite sure that the image is a photo and not an engraving or something? That could explain the heavily outlined fingers. Or maybe when it was first developed, the photographer added the outlines. It's a creepy effect, though.